Small, works well, unusual design. A touch on the noisy side. 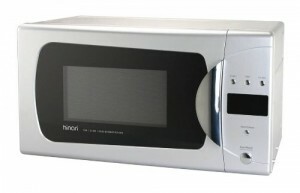 Weighing 10.5kg and measuring 45.4cm x 33cm x 26.2 cm is the Hinari HMW109, a 700w 20 litre grill microwave. The first thing that you notice about this microwave is the design - it's quite unusual, and may not appeal to all - the chrome curved handle in particular. It's finished in silver and black, with simple controls situated to the right hand side of the silver microwave oven. The black panels round the door is slightly asymmetrical in shape, and as such may not suit all kitchens - this is down to a question of tastes. The Hinari microwave's power output is 700w when in microwave mode, and 800w when using the grill facility, and overall capacity is 20 litres. It features six different settings, and also includes a speed defrost feature. The timer goes up to a maximum of 60 minutes, and is displayed on a digital LED display. 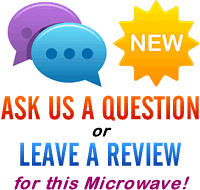 Overall it works pretty well - opinion was divided over the design of the microwave, but in terms of performance and function it worked pretty well. The Hinari HMW109 works well, but can be a little noisy. Features an unusual design, which may not appeal to all.